With an intention to set up a robust system to eliminate duplicate/ fake identities supported by verification and authentication in a cost effective manner, the government introduced the Aadhaar. Aadhaar is a unique identification number to be issued to all residents of India. Unique Identification Authority of India was created with the objective to issue Unique Identification numbers (UID) under Aadhaar to all residents of India. 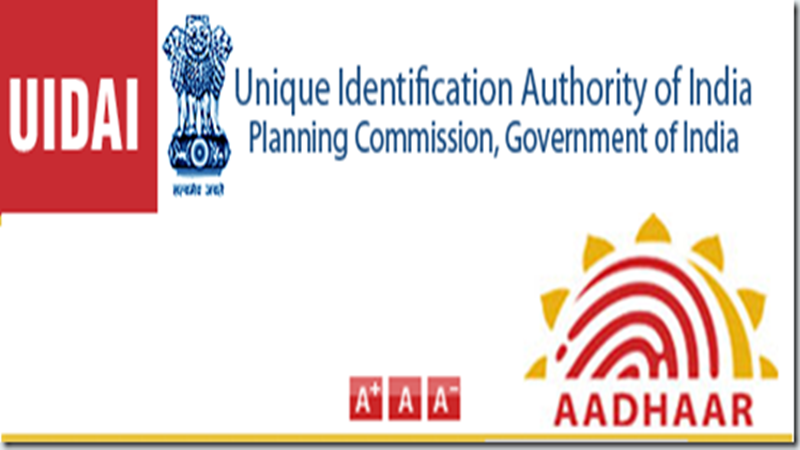 Under the Aadhaar Act 2016, Unique Identification Authority of India is responsible for Aadhaar enrolment and authentication, including operation and management of all stages of the Aadhaar life cycle, developing the policy, procedure and system for issuing Aadhaar numbers to individuals, perform authentication, and ensure the security of identity information and authentication records of individuals. In an ongoing process of linking all the identity cards (driving license, PAN, voter ID, passport) and accounts (bank accounts, mobile numbers, etc.) with the Aadhaar, the government is mandating the linkage in a phased manner. Currently, it is mandatory to link the PAN and bank account with the Aadhaar. The UIDAI provides services relating to Aadhaar on online as well as offline platforms. The services range from updating the details of the registered person, to correction of data and checking the status of requisitions raised. For availing these services on an offline platform, one may visit an enrolment centre with the required documents and have their issues resolved. To develop policy, procedure and system for issuing Aadhaar number to individuals, who request for the same by submitting their demographic information and biometric information by undergoing a process of enrolment. To ensure availability, scalability and resilience of the technology infrastructure. To ensure security and confidentiality of identity, information, and authentication records of individuals. The enrollment procedure consists of registrars and enrolment agencies. In coordination with the registrars, the enrolment agencies set up enrolment centres, where residents can enrol for Aadhaar. Multiple fingerprint scanners, iris scanners, and cameras, certified by the UIDAI are set up and connected to the UIDAI designed standard Application Programming Interface (API). Registrar Registrar is an entity authorised or recognized by UIDAI for the purpose of enrolling individuals. Enrolment AgenciesEnrolment Agencies are appointed by registrars and are responsible for collecting demographic and biometric information of individuals during the enrolment process by engaging certified operators/ supervisors. The UIDAI has set up a scalable procedure for the purpose of instant authentication of residents. The Aadhaar authentication ecosystem is capable of handling tens of millions of authentications on a daily basis and can be scaled up further as per demand. The Unique Identification Authority of India has appointed a number of Authentication Service Agencies (ASAs) and Authentication User Agencies (AUAs) from various Government and non-Government organisations. Unique Identification Authority of India is headquartered in New Delhi with eight regional offices and two data centres in India. The Authority consists of a Chairperson appointed on part-time basis, two part-time members, and a Chief Executive Officer (CEO) who shall be the member-secretary of the Authority. At the head office in New Delhi, the CEO’s team consists of seven Deputy Directors General (DDGs) and a Joint Secretary level Officers of Government of India as in-charge of various wings of Unique Identification Authority of India. The DDGs are supported by Assistant Directors General (ADGs), Deputy Directors, Section Officers and Assistant Section Officers. The HQ has a total sanctioned strength of 127 officers and staff members, including the Accounts and IT branches. Each of the regional offices is headed by a Deputy Director General (DDG) and the support structure comprises of assistant directors general, deputy directors, section officers, assistant section officers, senior accounts officer, accountant and personal staff. Unique Identification Authority of India has set up a Contact Centre for handling queries and grievances related to aadhaar enrolment, updation and other services. When a resident approaches an enrolment centre, the operator gives a printed acknowledgment for registering the complaint. The resident can further follow up for the status updates by quoting the number from the acknowledgment slip. Residents have an option to post their grievances to Unique Identification Authority of India headquarter or regional offices.The grievances are examined and then forwarded in hardcopy to concerned officer who is a public grievance officer at UIDAI. The concerned Regional Office/Concerned Section disposes the grievance by replying directly to the complainant under intimation to the grievance cell, UIDAI. The grievances are examined and then forwarded online to the concerned officer. Many times, grievance is received through e-mails by UIDAI officials. These emails are examined and forwarded to the concerned officers. The concerned officer disposes the grievance by replying to the complainant over e-mail under intimation to the grievance cell.